The Land Kerala is a dramatic, narrow, leaf-shaped strip of land, flanked by the formidable Western Ghats on the east, and the Arabian Sea on the west.A land of unabashed wealth,its people are amongst the most progressive and literate of the Indian populace. This tropical spice garden has lured the Arabs, Chinese and Europeans for many centuries. Christianity and Judaism entered the subcontinent through the legendary white sand beaches of Kerala. The region is also home to India's only virgin tropical rain forest the Silent Valley National Park, supporting an overwhelming range of life forms, many of which are highly endangered, and endemic to this part of the planet. There are broadly 44 rivers and streams in Kerala. Though tinier in dimension, compared to the major rivers of the country, they drain a surprisingly large quantity of water and sediments into the Arabian Sea. This is due to the heavy rainfall and physical relief of the terrain of Kerala, which slants from the Western Ghats to the plains to finally merge with the Arabian Sea. A distinct characteristic of the rivers in Kerala is that they flow in an almost straight course, further facilitating drainage. 41 of the 44 rivers in Kerala are west flowing, and originate mainly from the Western Ghats. They fuse with the Arabian Sea either directly, or through the medium of the backwaters. Some smaller rivers, like the Kumbala, and Bekal, have separate watersheds, and drain into the sea through the channel of the backwaters. 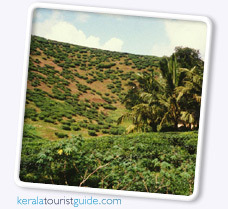 Kerala is bounded on the east by the Western Ghats that constitute a formidable natural boundary to the state. The Western Ghats engender a terrain of highlands that support a wide variety of animal and plant life, and shelter some of the richest biodiversity reserves in the country. The mountain range runs in a series of hills, ridges, buffs, and peaks. The higher peaks generally stand alone, rolling down to meet glens and valleys that intersperse the lofty peaks. The mountains gradually give way to smaller hills towards the west and the south. The Western Ghats roll along almost the entire length of the state, with the exception of one major break of 32km, in Palakkad District called the Palakkad Gap. The Palakkad Gap served as the artery through which Kerala kept in touch with the rest of the mainland, and was also the highway that witnessed the arrival of the Chola's, Chera's, and later Tipu Sultan's army, into the heartland of Kerala. The pass also provides the necessary passage for monsoon clouds to move in and spend themselves over Central Kerala. The climate of Kerala can be classified into roughly three categories from March to May, when it is hot and humid, with March being the warmest month. This season is followed by the onset of the southwest monsoons that last till the end of October. The northeast monsoons take over the relay around this time and linger on till the month of February. The intensity of the northeast monsoons is more or less on the wane around December, leaving behind a spell of cool and comparatively dry weather. produces the maximum quantity of cardamom in the world. 97% of India's pepper is grown in the moist lowlands of Kerala. 64 countries import turmeric from the state. Kerala also produces the maximum quantity of ginger in the country. Rubber, Clove and Cashew are other important products that rake in foreign exchange. Kerala grows an abundant quantity of cereals, pulses, spices, vegetables such as yam and arrowroot, and fruits like coconut, jack fruit, banana, custard apples, mango, pineapple, tapioca, cashew. Tea, coffee and cardamom are grown extensively on the highlands.